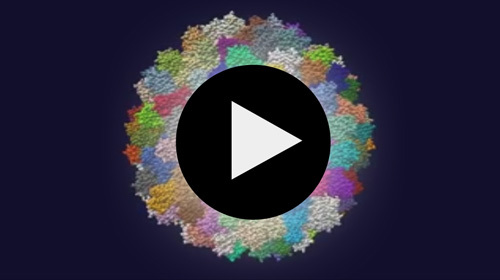 How can the behavior of proteins be visualized? The behavior of proteins in different solvents can be studied by molecular dynamic simulations. The continuous development of computer programs for simulation of molecular processes makes it possible to simulate more complex biochemical relationships on atomic level. Simultaneously more and more time-dependent data sets are created. The interactive visualization of these data is an essential component for an efficient analysis. However, the increasing complexity and size of the simulation results is a challenge for the interactive exploration an visualization, because the memory accesses and computation time increase in dependence of the data set size. In this subproject we develop appropriate visualization techniques which allow the user to capture the immense flood of data. Thereby the dynamic behavior of the molecules are made visible and scientists are able to see the dynamic behavior of molecules as an animation and to interact with the graphical representation.